The name of this corporation shall be the North Carolina Law Enforcement Officers Association. Its principal place of business shall be Raleigh, North Carolina. A. To promote closer relations between all persons interested in or actively engaged in the prevention of accidents and crime and enforcement of laws. B. To suppress crime by state-wide cooperation, in the arrests of criminals and searches for fugitives from justice. C. To instill in members of the Association integrity and just pride their work and thereby their profession and uphold the dignity of the law. D. To promote better public relations through civic organizations, to support such organizations in the interests of better public relations, and to advance friendly and courteous dealings with the public. E. To assist legislators in the enactment of needed criminal laws and the amendment of existing inefficient laws; take necessary action on all existing and proposed legislation that will affect the law enforcement profession. F. To create and maintain a line of duty death benefit plan for its members. G. To establish, publish and distribute a Journal devoted exclusively to maters of interest to law enforcement officers. These classifications are defined more fully in Article XI. BOARD OF DIRECTORS. The Board of Directors shall manage the business affairs of the Association. The Board of Directors shall be comprised of the Chairman of The Board (Immediate Past President), President, First Vice-President, Second Vice-President, Third Vice-President, Secretary-Treasurer, Sergeant-at-Arms, and twelve members at large. TERMS OF OFFICE. Members of the Board of Directors shall hold their offices for a term of three years. Four members shall be elected at each annual conference to replace those four members whose three-year terms are about to expire. The elective officers of the Association shall be a President, First Vice-President, Second Vice-President, Third Vice-President, Secretary-Treasurer and Sergeant-at Arms. These elective officers shall hold their respective offices for a term of one year or until their successors are elected and qualified. These officers shall be active members and elected by ballot at the annual conference of this Association by a majority of the attending voting members. Any nominee for President shall have served a minimum of three years as a member of the Board of Directors and/or Officers of the Association. A fund shall be created to provide for the payment of a death benefit to the designated beneficiaries of any active member of the Association who dies as a result of injuries received in the line of duty. The Board of Directors shall, by proper resolution and without delay, appropriate sufficient money to the death benefit fund to pay death and to defray costs incurred by the Death Benefit Committee. The amount of the death benefit payable to any beneficiary or estate shall be in the amount which has been set by majority vote of the Board of Directors or the annual conference delegates. Benefits shall be payable only to designated beneficiaries of active members who are in good standing and not under suspension of duty at death. The Death Benefit Fund shall only cover active members. The Secretary shall submit to the Death Benefit Committee all information pertaining to a claim against the death benefit fund. Should a death benefit be awarded by the North Carolina Industrial Commission on this claim, then the Death Benefit Committee may accept the Industrial Commission’s determination as conclusive proof that the death was in the line of duty and award benefits. Should a death benefit not be awarded by the North Carolina Industrial Commission on this claim, then the Death Benefit Committee may accept the Industrial Commission’s determination as conclusive proof that the death was not in the line of duty and deny the claim for benefits. If the claim involves a law enforcement officer who was not employed full time at the time of his death, then the Death Benefit Committee may conduct an investigation to determine whether the circumstances of the officer’s death met these By-Laws and in N.C.G.S. § 143-166.2.
experienced in the course and scope of his official duties while in the discharge of his official duty or duties. (N.C.G.S. 143-166.2 ( c ) ). The Board of Directors may terminate the death benefits fund without advance notice and shall transfer any monies in the Death Benefit Fund to the General Fund of the Association only after approved outstanding claims have been settled. Members of the Association shall receive certificates of membership in the classifications to which they belong. These certificates shall entitle members to all privileges of the Association based upon that classification. A certificate shall not entitle a member to any pecuniary or financial gain of any form. If a member resigns, is suspended or is expelled because of any violation of the By-Laws or Association rules, or because of non-payment of dues or assessments, the member shall forfeit any and all rights or interests in the property of this Association and shall surrender this certificate of membership which will be canceled. (3) as specifically limited by those specific powers and duties granted solely to other authorities in the Association. The Board of Directors shall be found by the action taken by a majority of the active members present during any duly convened annual conference or duly convened special conference. The Board of Directors shall not convene a meeting which conflicts with any business session of the Association. (3) upon written request of any six members of the Board of Directors. The Board of Directors may authorize the employment of the necessary personnel to conduct Association business. The Board of Directors shall determine the powers and duties of these employees. Each of these directors shall have voting powers except the Chairman of The Board, who shall vote only in the case of a tie. Four of these directors shall be elected at each annual conference for a three year term. One Director shall come from each district. A. The Board of Directors may fill vacancies for any unexpired term which occurs in any elective position. That appointee shall remain in the appointed position until the next annual conference. (4) There is a change in the officeholder’s Active Membership status. The President and each Vice-President shall be from a different district when possible. Each of the four Board of Directors in their respective terms shall be from different districts. The Secretary-Treasurer and Sergeant-At-Arms may be elected from any district. The President shall be chosen from the eligible Vice-Presidents or eligible members of the Board of Directors of the Association. The outgoing President shall not be eligible to serve as President for a period of five years after the end of his term of office. The President shall meet the requirements set forth in ARTICLE V above. The term of office for the elected officers shall be one year from the date of election or until such times as their successors have been duly elected and qualified. The Secretary-Treasurer may serve longer at the discretion of the Board of Directors if service is satisfactorily rendered and he is re-elected. The Secretary-Treasurer may be relieved of his duties for other causes. Nominations for officers and directors shall be allowed from the floor at the annual Conference in addition to the nominations offered by the Nominating Committee. Nominees must meet the qualification requirements set forth in ARTICLE V.
PRESIDENT- The President shall preside at all meetings of the Association. The President’s decision in conducting Association meetings shall be final unless otherwise provided for by this constitution. The President’s decision may only be reversed by two-thirds vote of the membership present at the regular annual conference. The President shall appoint temporary officers in the case of extended absenteeism. The President, with approval of the executive committee, may call a special meeting of the Association as occasion or circumstances warrant, with advance notice to the membership of the purpose, date, time and place of such special meeting. The President or his designee and Secretary-Treasurer shall sign all checks drawn against the fund of the Association. FIRST VICE-PRESIDENT- The First Vice-President shall act as presiding officer of the Association during the temporary absence or disability of the President. The First Vice-President automatically shall succeed to the office of President in the event of the death, disability, resignation or removal from office of the President. Under these circumstances, the First Vice-President shall serve the unexpired term of the outgoing President. Under these circumstances, the First Vice-President shall serve the unexpired term of the outgoing President. The First Vice-President The First Vice-President’s duties shall also include serving on both the Conference Committee and the Benefits Committee. SECOND VICE-PRESIDENT- The Second Vice-President shall act as the preceding Office of the Association during the temporary absence of the President and the First Vice-President. The Second Vice-President shall automatically succeed to the office of the First Vice-President in the event of death, disability, resignation or removal from the office of the First Vice-President. The Second Vice-President shall serve the unexpired term of the First Vice-President. The Second Vice-President shall serve the Audit and Budget Committee. THIRD VICE-PRESIDENT- The Third Vice-President shall act as the presiding Officer of the Association during the temporary absence or disability of the Second Vice-President. The Third Vice-President shall automatically succeed to the office of the Second Vice-President in the event of death, disability, resignation or removal from the office of the Second Vice-President. The Third Vice-President shall serve the unexpired term of the outgoing Second Vice-President. The Third Vice-President shall serve on the Resolutions and By-Laws Committee. (6) Draw all orders for the Association, or as otherwise provided for, which he shall sign after they have been attested to by the President. (7) Maintains oversight responsibility for supervision of the daily operation of the NCLEOA office and Association employees. (1) ACTIVE MEMBERS- Persons who are: (a) certified by the North Carolina Criminal Justice Education and Training Standards Commission; or (b) certified by the North Carolina Sheriffs’ Education and Training Standards Commission; or ( c) Sheriffs; or (d) federal law enforcement offices with the power of arrest. (a.) Regularly retired form a law enforcement agency and currently receiving benefits from a federal, state, or local government retirement program. (b.) Medically retired from a law enforcement agency and currently receiving benefits from a federal, state, or local government program at the time of disability was an active member of the Association. (c.) Completed ten (10) or more years of service as a law enforcement officer as defined in this Article of these By-Laws with five (5) consecutive years of active membership prior to retirement. (3) LIFE MEMBERS– Persons who are current or former members who are elected to life membership by the Board of Directors for having rendered an extraordinary service to the Association. Life members shall be considered active members of the association provided such life members meet the criteria required for active membership. (4) ASSOCIATE MEMBERS- Persons who are (a) not eligible for active membership; or (b) other individuals subject to the approval of the Board of Directors. (5) HONORARY MEMEBERS- Persons who are ineligible for active membership but whom the Board of Directors have qualified. Any amendment to the By-Laws which changes the classification or status of a member shall not affect his membership rights to which he was entitled prior to the amendment. An application or request of a Life Membership or Honorary Membership must be submitted in writing to the Board of Directors, which will refer it to Membership Committee for investigation, review, and recommendation, prior to a vote by the Board of Directors. The President may appoint any other special committees as needed. These special committees shall be dissolved at the conclusion of their assigned project or operation. Each of the standing committees and special committees shall consist of a chairman and at least two members appointed by the chairman with the concurrence of the President. The President shall be an ex-officio member of the standing and special committees. The President or the Board of Directors shall have the power to remove any member of any committee for neglect of duty. A majority of the voting members at the annual conference of the North Carolina Law Enforcement Officers Association shall approve the annual dues which will be effective beginning January 1 of the year following the annual conference. The initial dues payment by a member will cover a period ending on the last day of June or the last day of the fiscal year in which the dues are paid. Future dues payment will be due on the first day of July and on each anniversary thereafter. (2) There is an interruption in the active membership status or requirements. An active member’s membership benefits may be reactivated by payment or current dues within six months of the membership termination. If the dues are not paid within six months, the member shall submit a new application for membership. A member shall have no claim for benefits during the time of his membership in a lapsed state. Each member shall pay his dues within the first thirty days of each new members year without further notification from the Association or its officers. These By-Laws may be amended only at an Annual Conference or at a Special Conference called for that purpose. A proposed amendment may be submitted by the Board of Directors or by twenty-five eligible members of the Association. Proposed amendments to the By-Laws shall be presented in writing to the Secretary of the Association and must be published in the Journal at least thirty days prior to the Annual or Special Conference. Only eligible voting members shall vote on amendments. A majority of the votes of the voting members present shall be sufficient to adopt the amendment. Upon the legal dissolution of this Association, the Board of Directors shall pay all outstanding debts and obligations and place whatever funds are remaining into a trust fund payable upon death in proportion to the designated beneficiaries of members who are in good standing at the time of the dissolution but have subsequently died. The Board of Directors shall deposit all funds belonging to the Association with a trust company qualified to accept trusts in the State of North Carolina and shall create a trust indenture implementing the terms of this Article. All members of the Association shall render proper and faithful adherence to the laws of the State of North Carolina; shall abide by the Articles of Incorporation and By-Laws of this Association; and shall faithfully discharge the duties of their office. No members shall, in any manner, utilize the Association as a means for personal political advancement. Rank does not exist while attending Association meetings. All members are law enforcement officers, regardless of their position or rank. All members shall promptly pay all dues, assessments, fines which may be assessed against them. Any Association members who sells, loans,, or gives away his membership certificate or other insignia indicative of active membership shall be forever barred from further Association membership and benefits. At such time a member no longer meets the criteria for active membership as set out in Article XI, Section 1 of these By-Laws, his status as an active member shall be automatically suspended. His status shall be changed to Associate Member. Each member shall notify the Association through its business office of his changed status. Failure to do so within five (5) business days may result in total loss for one year. If a member retires from active law enforcement duty, his membership status does not result in suspension of his active membership; rather, the rules governing membership for retirees shall prevail. (3) Termination of employment by a Federal Agency. An expelled member may apply for a review of his status by the Board of Directors which shall review such requests at the next regularly scheduled meeting. A majority of the members of the Board present may render a decision. Membership dues are not refundable when membership is revoked. The Board of Directors shall suspend or remove any Board member who loses the status of Active Member. In addition to loss of membership, the Board of Directors may remove any member of the Board for misuse of Association funds or property. The removal of a Board member shall be by a two-thirds (2/3) majority vote of the Board. A member whose application for membership was submitted with fraudulent information or with misrepresentation facts shall have that application canceled and shall forfeit any and all benefits and any privileges afforded by that membership. The Board of Directors may grant a hearing to reinstate the membership. The Board of Directors, by majority vote, is authorized to pay monthly the Secretary-Treasurer and other employees for services rendered. In its discretion, the Board of Directors may compensate other Association members for special work. Recent decades have seen a significant increase in the number of cases where Law Enforcement /Criminal Justice Officers have been subjected to criminal indictment or civil liability actions as the result of their attempting to pursue their lawful duties in good faith . In many instances, these officers have been required to make decisions where the law is not clear and where the good judgment of the officer (s) involved had to be relied on for whatever action was appropriate to preserve peace, prevent violence, or enforce laws. As the result of arrests made, or other action taken, in the exercise of their best judgment, officers have sometimes been subjected to severe criticism, indictment, or civil suit. This has seriously hampered the effectiveness of the entire police/ criminal justice profession and sometimes ruined careers of otherwise dedicated and useful public employees. The majority of such charges were later unfound and proven false has been little consolation to an officer whose career was jeopardized and who was subjected to such indictment or civil suit without adequate funds for his/her own defense. Therefore, be it known to all members of the North Carolina Law Enforcement Officers Association (hereafter referred to as NCLEOA) resolves to continue a program of financial assistance to any active member in good standing who needs such assistance to employ legal counsel to defend a civil or criminal action where such action arises directly as the result of the performance of the duties as a Law Enforcement Criminal Officer. Such indictment or civil suit must name the member (s) as an individual defendant, and must be filed in a court, or judicial system, of competent jurisdiction. A member convicted* of a criminal offense by a court of competent jurisdiction shall be ineligible for benefits described herein. A member having his certificate as a Law Enforcement/Criminal Justice Officer revoked by either the North Carolina Criminal Justice Education Training and Standards Commission shall likewise be ineligible for this benefit. This resolution is not designed to address, nor shall it cover, any internal or administrative actions filed against a member by his/her own agency or any other regularity body. The NCLEOA establishes a maximum amount to be paid in any one case as set by the Board of Directors at the first Board meeting after the Annual Conference. All claims for financial assistance are submitted to and approved by the Board of Directors and paid by NCLEOA directly to the Attorney or Law Firm representing the member. 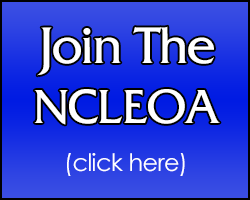 Any member requesting consideration for payment of this benefit must agree to submit to NCLEOA any and all documents, records, reports, or other pertinent data as requested in order to assist in the evaluation of the member’s claim. Receipt of a statement from the office of such legal counsel will be required to be filed with NCLEOA before payment can be made. NCLEOA shall not reimburse any Federal, State, or Local unit of government, any agency thereof, or any private organization of which the member had funds expended on his/her behalf in a defense of any action described herein. This resolution is meant solely to assist those member who require personal financial assistance in cases where other legal representation is unavailable. Any member denied coverage under this resolution may appeal such action, either in person or by the way of his/her legal counsel or other personal representative, at the next regularly scheduled meeting of the Board of Directors. The decision of the Board of Directors shall be considered complete and final if there is no such appeal, or final after the closed session vote upon hearing such appeal. It shall remain the responsibility of the Board of Directors to work out the details pertaining to the administration of this program which are not covered in this resolution. This revised resolution of assistance adopted at the 1994 NCLEOA Annual Conference, shall remain in effect until such time as rescinded or amended by a sitting Board of Directors of NCLEOA. Any such revision shall not affect consideration of any outstanding claims already filed with NCLEOA. (c) the entry of a plea of no contest, nolo contendre, or the equivalent.